Success-hungry dominant players in the global single-use bioprocessing sensors and probes market have mostly grown through strategic alliances and acquisitions that have helped them enhance their product base. Currently, a handful of big global names and many regional companies operate in the market. A key trend in the market is differentiated products which serves to lessen the intensity of competition among players. A number of factors are helping to catalyze growth in the global single-use bioprocessing sensors and probes market. They are thrust on easier, improved monitoring of bioprocess, robust demand from industrial bioprocessing, growing preference for customization of single-use products keeping in mind the specific needs of the consumer, and reduced cost and technologically advanced products. Acting as a roadblock to the market, on the other hand, is the limitations and technical issues in the use of single-use sensors and environmental concerns over the use of disposables. According to a report by Transparency Market Research, the global single-use bioprocessing sensors and probes will likely expand at a robust 13.4% CAGR between 2017 and 2025 to become worth US$1281 mn by 2025 from US$418.3 mn in 2016. Depending upon the type of product, the global single-use bioprocessing sensors and probes market can be segmented into market pH sensor, valve, bench top control system, spectroscopy technology, optochemical DO (dissolved oxygen), temperature sensor, pressure sensor, fill weight, fill level, conductivity sensors, flow rate sensors, pCO2 sensors and osmolality. At present, the bench top control system leads the market and in 2016, its leading share was around 24.1%. In future too, the segment is expected to hold onto its leading share by expanding at a CAGR of 13.9%. At this rate, the segment will become worth US$323.3 mn in 2025 from US$101.0 mn in 2016. The valve segment trails the bench top control system segment in terms of market share. In 2016, the segment held a share of about 19.7% in the market from US$81.3 mn in 2016. The segment is likely to reach value of US$252.5 mn by 2025. In terms of growth rate, however, the pCO2 segment is expected to lead the market by clocking a CAGR of 15.0% from 2017 to 2025. pCO2 sensors are instruments used in the bioprocess industry to measure the partial carbon dioxide. These sensors provide air and pCO2 measurement in bioprocessing. From a geographical perspective, North America held a leading share of 40.2% share in 2016 in the global single-use bioprocessing sensors and probes market. The market in the region is powered primarily by the U.S. which has made gigantic progress on account of the swift uptake of latest technologies, presence of a well-established bioprocessing and pharmaceutical industry, early availability of newest technologies, and heightened research activities. Going forward, North America is expected to grow its share further in the market. Europe trails North America in the global single-use bioprocessing sensors and probes market. In the upcoming years, the region is predicted to lose its market share to become worth US$330.8 mn by 2025. In terms of growth rate, Asia Pacific is anticipated to outshine all other regions by registering a CAGR of 13.8% between 2017 and 2025. The region is primarily powered by China, India, and Japan. Adoption of upcoming technologies and expansion of the biotechnology sector is said to be underpinning robust growth in the region. Prominent companies operating in the global single-use bioprocessing sensors and probes market are Thermo Fisher Scientific Inc., Sartorius AG, Parket Hannifin Corporation, and Hamilton Company. This report on single-use bioprocessing sensors and probes market studies the current as well as future prospects of the market globally. The stakeholders of this report include companies and intermediaries engaged in the manufacture, commercialization, providing services of single-use bioprocessing sensors and probes products such as pH sensor, valve, bench top control system, spectroscopy, optochemical DO, temperature, pressure as well as new entrants planning to enter this market. This report comprises an elaborate executive summary along with a market snapshot providing overall information of various segments and sub-segments considered in the scope of the study. This section also provides the overall information and data analysis of the global single-use bioprocessing sensors and probes market with respect to the leading market segments based on major applications segment, products segment, and geographies. The market overview section of the report explores the market dynamics such as drivers, restraints, and opportunities that currently have a strong impact on the single-use bioprocessing sensors and probes market and could influence the market in the near future. Market attractiveness analysis has been provided in the market overview section in order to explain the intensity of competition in the market across different geographies. The competitive scenario among different market players is evaluated through market share analysis in the competitive landscape section of the report. All these factors would help market players to take strategic decisions in order to strengthen their positions and expand their shares in the global single-use bioprocessing sensors and probes market. Based on the product type, the single-use bioprocessing sensors and probes market has been segmented into: pH Sensor, valve, bench top control system, spectroscopy, optochemical DO, temperature, pressure, and others. Each of the market segments have been extensively analyzed based on the market related factors such as increasing demand of single-use bioprocessing sensors and probes worldwide, and technological advancement. Moreover, historical year-on-year growth have been taken into consideration while estimating the market size. The market size and forecast in terms of US$ million for each segment has been provided for the period from 2015 to 2025. The report also provides the compound annual growth rate (CAGR %) for each market segment for the forecast period from 2017 to 2025, considering 2016 as the base year. 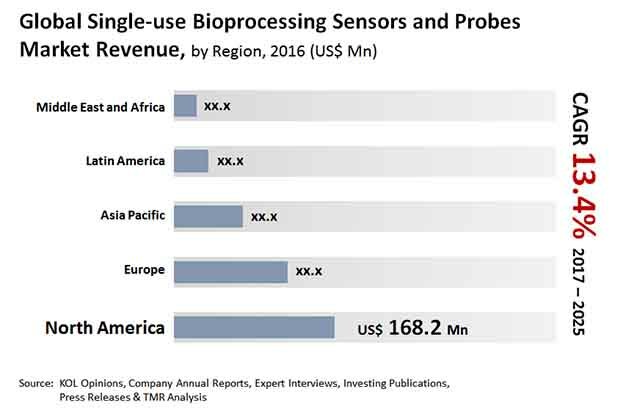 Geographically, single-use bioprocessing sensors and probes market has been segmented into five major regions: North America, Europe, Asia, Latin America, and Middle East & Africa. The market size and forecast for each of these regions has been provided for the period from 2015 to 2025, along with their respective CAGRs for the forecast period from 2017 to 2025, considering 2016 as the base year. The report also provides with market size and forecast for major countries in the respective regions. A detailed qualitative analysis of factors responsible for driving and restraining the market growth and future opportunities has been provided in the market overview section. This section of the report also provides with market attractiveness analysis, Porter’s five forces analysis, and market share analysis by key players, thus presenting a thorough analysis of the overall competitive scenario in the global single-use bioprocessing sensors and probes market. The key findings section included in the report would assist existing market players in expanding their market shares, and new companies in establishing their presence in the global single-use bioprocessing sensors and probes market. The report also profiles key players operating in the single-use bioprocessing sensors and probes market which are Sartorius Stedim Biotech S.A., Eppendorf AG, Thermo Fisher Scientific, Inc., Hamilton Company, Honeywell International, Inc., Broadley-James Corporation, GE Healthcare, PendoTECH, LLC, Polestar Technologies, Inc., PreSens Precision Sensing GmbH, and Parker Hannifin Corporation.